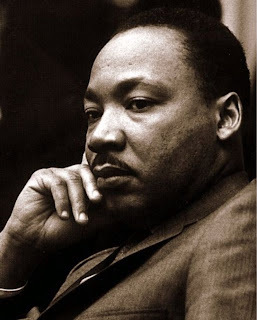 When my kids were little and attending preschool in SE Texas, I asked the teacher why there was nothing on the monthly curriculum outline about MLK day. She informed me that nothing was planned and when I pressed her, said "We already have a plan that week to study community helpers, like policemen and mailmen." I replied first, that MLK most certainly met my criteria as a community helper, and secondly, not all police or letter carriers were men. That fell on deaf ears, but I felt it important to say. We pulled our kids out of school that day and with some friends, had our first MLK party. We made a big banner for the front of the house honoring Dr. King. The kids reenacted Rosa Lee Park's historic bus ride, and learned songs about civil rights. Then we made cookies (gingerbread, chocolate and sugar) cut out to people shape and distributed them to firefighters and others who did not get a holiday that year. Not all resistance has to be violent, or even disagreeable. Resolve today to stand up, in a kind but firm way, to dismissals of inherent worth and dignity of all people. It doesn't have to be a grand gesture to be part of the positive tide.